Seems like an awful lot for well under $200. 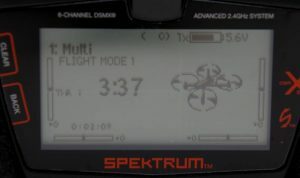 In 2014, Spektrum (the brand known worldwide as a cornerstone of the radio system market) released the DX6, the long awaited upgrade to their popular, entry-level computerized radio, the DX6i. With features surprisingly similar to high-end units like the DX9 (albeit with three fewer channels), the DX6 – seductively wrapped in an all-black shell – provided virtually unlimited model memory, voice alerts, a plethora of 3-position switches, built-in telemetry, and too many upgrades to list. At $199.99 ($229.99 w/AR610 receiver), the DX6 represented a significant leap forward for DX6i owners ready to move on from their first multi-model radio. All the switches you’ll ever likely need … and this is only the left side! The comfortably familiar and easy to use jog dial for programming or other selections. Wireless trainer only: no wired trainer, which is necessary for “buddy-boxing” with a DX4/5/6i (and for computer simulators). Non-diversity (two-fixed) antenna: The DX6e utilizes a single adjustable antenna. While antenna configuration (and signal “cone”) is too complicated a subject for this review, suffice-it-to-say that while diversity is preferable, having the ability to adjust the DX6e’s antenna angle (nine positions from vertical to near-horizontal) may help to reduce signal loss if you hold your radio at an unusual angle (e.g. with antenna pointed at the plane or the ground ­– either being less than ideal). (An important note: the first release of the DX6 – model SPMR6700 – had only one fixed antenna. 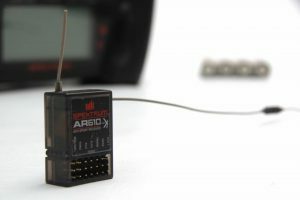 The second release – the SPMR6750 – upgraded the antenna to diversity.) Therefore, the DX6e’s adjustable antenna could be seen as a step up from the first generation (2014) DX6. No voice alerts: As contemporary radio systems continue to incorporate modern technologies, voice alerts (VA) are becoming more and more common. Regarding VA, however, I’m convinced there are two types of pilots in the world: the first type would love nothing more than to spend a rainy day setting up multiple VA corresponding to flight modes, rates/expo, flap position, landing-gear, mixes, throttle-cut, etc. For these pilots, their radio is an expression of their technological prowess, and it’s not uncommon for their volume settings to bang up against 100% (so that all others can partake). The second type is more likely to walk by that talking radio… and smash it with a rock. If you’re the latter, you’ll find the DX6e’s beeps and tones to be more than adequate. DX6e includes a dual-rudder/dual-elevator mix. Gimbal tension adjustments situated around gimbals on the radio face dispenses with the disassembly required to adjust your gimbals on other radios. Power button vs power switch. Normal throttle for modes 2 and 4 (Air, Heli, and Sailplane model types). Spring-centered throttle for modes 2 and 4 (Multirotor model type). Spring-centered throttle for modes 1 and 3 (Multirotor model type). 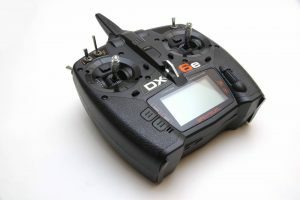 Lap timer: Of particular interest for multi-rotor racers, the DX6e includes a lap-timer function, which allows pilots to store and retrieve lap times. No downloading to computer required. 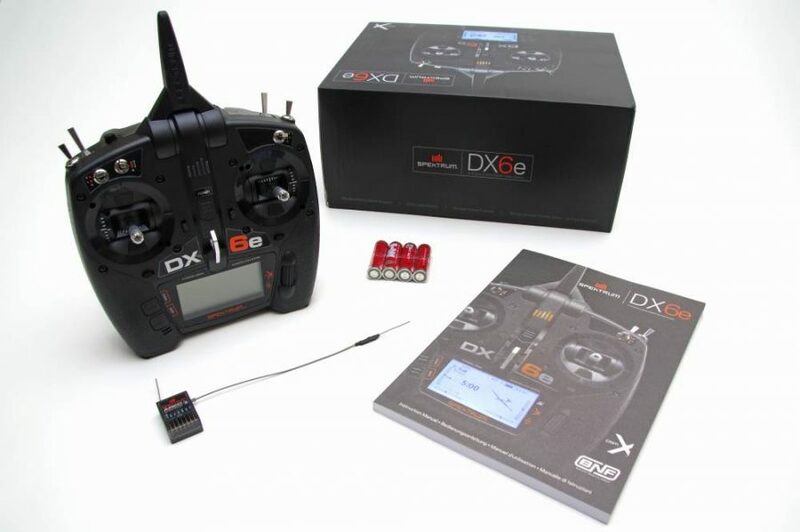 Helis, Gliders and Planes … oh my, but also drones on the DX6e. Ergonomics: The DX6e’s case is slightly more curved than the DX6, and its base tapers in a way that I found surprisingly comfortable. As a pincher, I find the location of the gimbals in relation to the radio’s frame is just right. 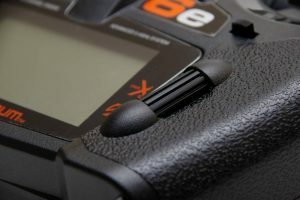 Power button: If you’ve ever accidently knocked your radio’s power switch, only to find your battery dead the following morning, the DX6e’s power button may be just what the doctor ordered. Requiring a deliberate press to turn on, and a press-and-hold (for a few seconds) to turn off, this feature may help to prevent the frightful experience of reaching for a trim switch in flight, only to knock the power button off. Gimbal quality: As opposed to the original DX6i (which used bushings), the DX6e shares the same quad-bearing gimbals with the more expensive offerings from Spektrum (DX6 through DX18). 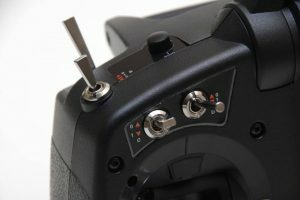 Factory tension levels will work for the vast majority of flyers, however, if you should feel the need to make tension adjustments, fear not, as the DX6e offers easy access to the tension adjusting screws (situated around the gimbals on the radio’s face). 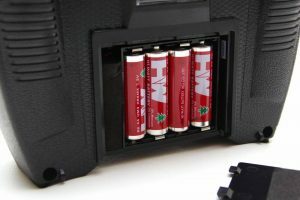 Batteries: The DX6e comes stock with four AA batteries, but also allows for an upgrade to Lithium-Ion (SPMA9602 and a power supply SPM9551 for charging). I’m a fan of this flexibility as I can keep a set of AA batteries in my flight bag, knowing if I ever get to the field with a dead radio, I’ve got back-ups at the ready. A common question I get asked by new pilots is, “I bought a ready-to-fly (RTF) ultra-micro that came with its own radio. I had fun, but now I’m thinking of getting a larger plane/building a kit. What radio should I buy?” After grilling them about their level of long-term interest in the hobby my response usually includes a reference to the familiar home-buying axiom, “You don’t want to over-buy, and you don’t want to under-buy.” While some pilots know after their first flight whether they’re in this hobby for life, for many others the realization develops slowly. For the latter, making a large financial commitment on a radio system “with legs” can seem daunting. It’s for this pilot the DX6e is uniquely placed. Capable of enhancing the flight experience of any already-owned bind-n-fly plane/multi-rotor (with Spektrum guts), the DX6e is capable of carrying a pilot through many years of multi-function enjoyment. Should that pilot ever require more than six channels, the DX6e’s wireless trainer function makes it a perfect “buddy-boxer,” and it’s near-unlimited model memory and surprisingly advanced list of functions make it the ultimate hand-me-down. For a cool 179.99, Horizon sells the DX6e bundled with the AR610 receiver. Whichever Spektrum radio system speaks to you (pardon the pun), the wide range of options –from the single-model DXe up to the drool-worthy DX20 – will allow pilots of any skill or budget level to choose his or her own path. The new DX6e is a worthy addition to an already wide-ranging lineup and provides a level of quality, function, and customization that not so long ago would have required a much more serious financial commitment. Lacking surprisingly few of the bells and whistles commonly found in higher-end units, the DX6e stands ready to welcome a new pilot into the world of customizable, multi-model, computerized radios.